The weather forecast for Wednesday 6 July turned out to be as promised with winds freshening overnight and becoming noticeably strong, even deep in the harbour at Svendborg. With a gale warning in force for SW and W Baltic no boats were leaving! So we headed to get the train for the 45 minute journey to Odense, the main town of the island of Fyn. What was immediately apparent is that there are major infrastructure works in progress. A main road that divided the city centre in two has been closed and along its route major changes are being made. Not surprisingly there is also a knock on effect to other roads and so you do end up regularly skirting construction barriers. 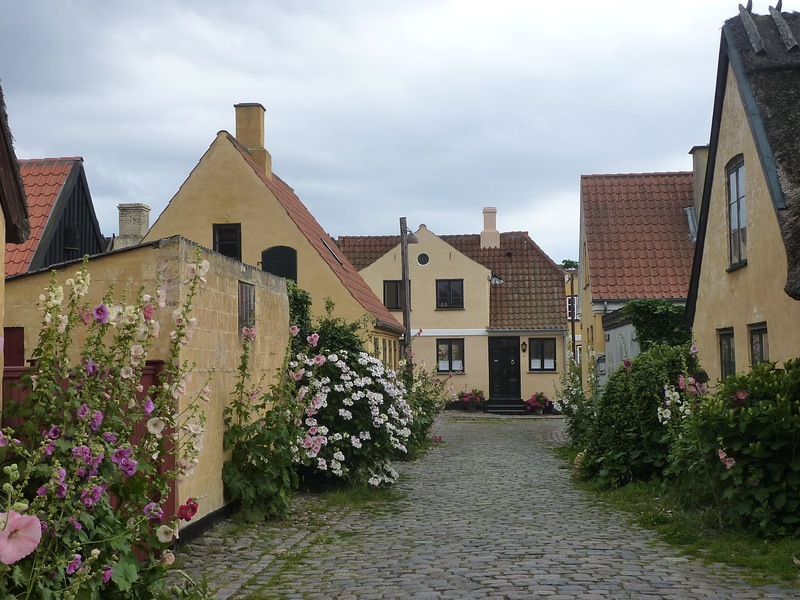 Odense trades heavily on being the birthplace and home town of Hans Christian Andersen and the HCA Quarter (also known as the Historic Quarter) has plenty of old houses, cobbled streets, cafes and shops as well as Hans Christian Andersen Hus! We stumbled on the home and gardens and fortuitously one of three summer daily performances of “21 fairy tales in 21 minutes” was under way so we enjoyed that for a while. Our next call was at the impressive cathedral where, in the crypt, you can view the bones of King Canute. The Cathedral was built in the 1300's and is named after King Canute who was murdered nearby in 1086. Two other early Kings of Denmark, King Hans and King Christian II are also buried in the Cathedral. We then spent time and had lunch in the Latin Quarter. This is the heart of the arts and cultural side of the city, including Brandts, once a textile factory with its characteristic industrial yellow brick architecture. We spent a while admiring furniture and interior design objects from Danish and international designers in Lerche Design said to have been voted the world's best “Visual Merchandise” store and the best design shop in Denmark. Back in Svendborg it was the evening of the European Championships first semi-final with Wales playing Portugal. Fortunately it was being shown on the television in the small harbour information office; unfortunately Wales lost 2-0! But they had achieved more than they ever expected by just being there. During the night the wind began to subside and on a sunny morning with a F4 W wind forecast we, like many others, slipped the mooring. We followed a small Danish warship heading S down the sound then after a few miles turning W around the island of Thuro and then heading N up the coast of Fyn. Amazingly the wind direction held steady so we sailed on a pleasant beam reach although, as we have come to expect, the wind was stronger than forecast being generally F5 and quite regularly F6. Still it made for good sailing as we sped along at between 6 and over 7kn. 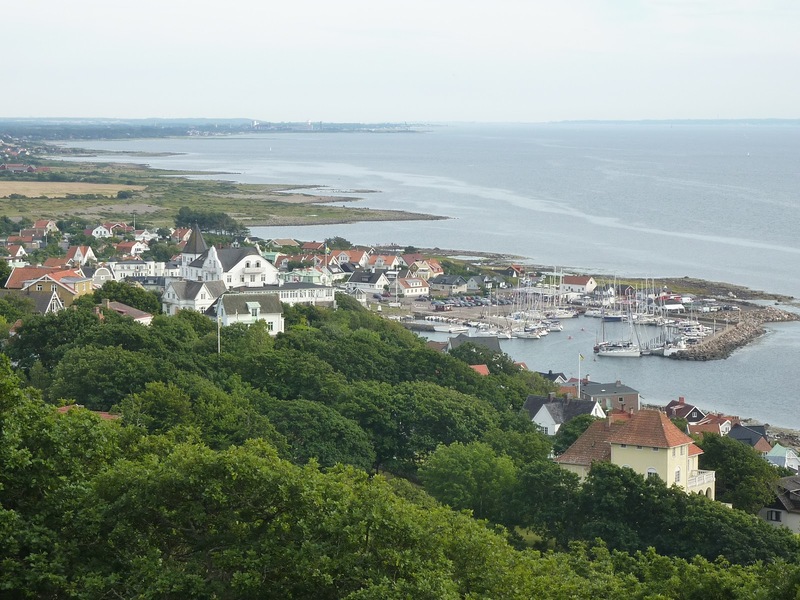 We soon covered the 25nm to Nyborg and found space in the Osterhaven (West Harbour) very close to the town centre. 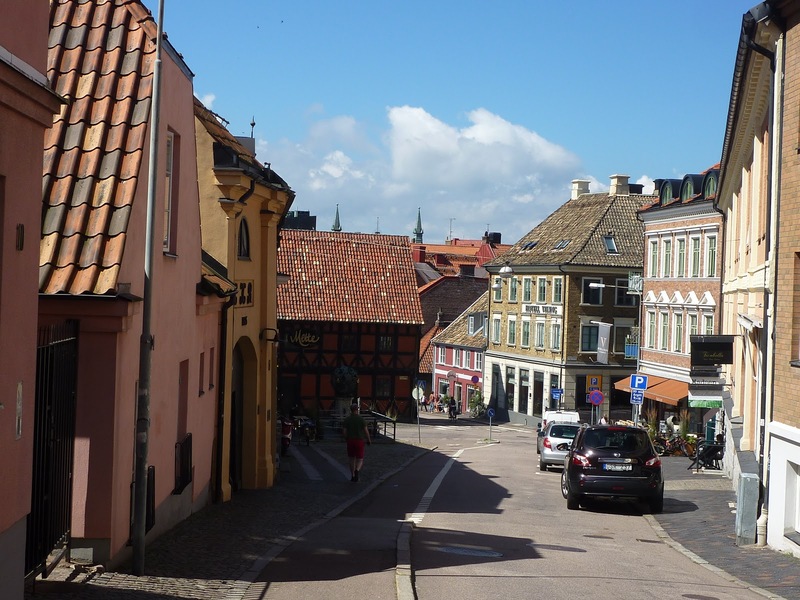 Until 1560 Nyborg was Denmark's first capital and where the first constitution was signed in 1282. Today it is a small town. But it does have a castle (the first mentioned in 1193) with impressive ramparts and a moat and the centre is full of old merchant's houses and other attractive buildings. 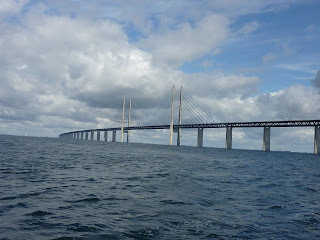 Nyborg was previously a busy ferry port but in 1997 an 18km bridge – the Great Belt Bridge – was opened connecting Fyn to the mainland of Denmark. 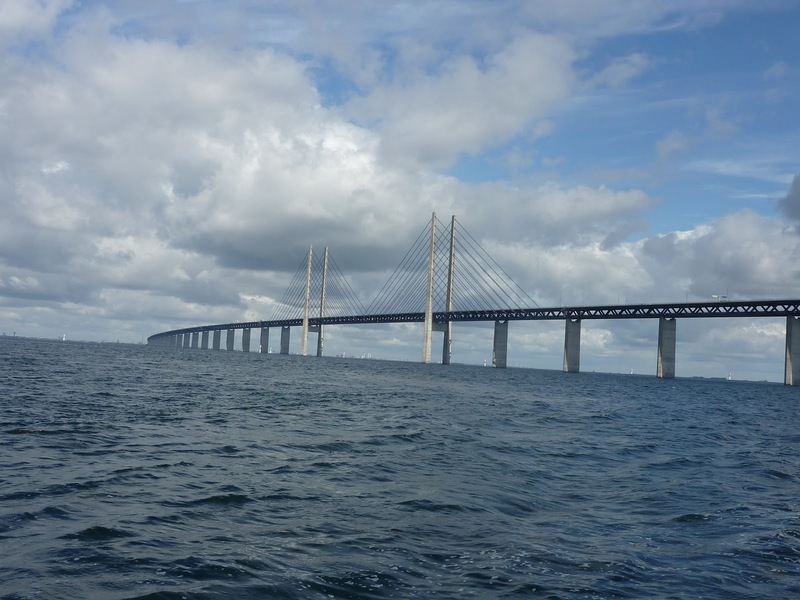 The west section rests on 63 bridge piers and is a combined road and rail bridge; the east a road suspension bridge and here there is also Europe's second longest submerged tunnel 8 km long, 75m under the sea surface. As a sign of the times you pass an old laid up ferry as you enter the harbour. Still good news for leisure craft as we now make use of an area that must have been busy with commercial traffic many years ago. We planned to leave promptly on Friday morning but unfortunately a problem with the heads (toilet) sea water supply meant that maintenance work was required. This took longer than expected so we decided to spend time catching up with clothes washing, boat (house) cleaning and other domestic tasks. It also meant that we could see a special evening event in Nyborg. This involved live music, food and drink stalls and general shop openings from 1800 onwards. Unfortunately heavy rain began at around 1600 and continued until a little after 2000 putting a dampener on proceedings. By 2000 we were wet enough so retired to the boat although we could still hear the bands playing. So it wasn't until the following morning that we slipped our mooring and headed across the Great Belt to the little island of Agerso. We had a pleasant motor sail the wing being mainly behind us and fluctuating from a gentle F3 to gusts of F6. We were slowed a little by having to dodge two ships in the channel just S of the Great Belt Bridge. But after just over three and a half hours and 20nm we easily identified our target by the departure of the ferry and we were soon entering the very small harbour. At that time we could easily find ourselves a space alongside the harbour breakwater but as expected for a Saturday in the holiday season by 1700 the harbour was very full. Agerso is only about six miles north to south and two miles at its widest point and we covered the island on our bikes in the afternoon. The oldest farm on the island was established around 1830 and most of the development including houses, church and mill were around 1870-1920 or so. The island now depends on agriculture, fishing and tourists and it has a few camp sites for young and old! On our ride around we saw quite a coastal area used by birds (heard many skylarks), the old battery built in 1808 during the war with England and the small lighthouse on the southerly tip. As we approached this Andrea said that she could see a lady on the top floor beside the lantern. I could not. There were two doors to the lighthouse, both locked! But as we came away we spotted a lady cleaning the glass around the lantern! So not a ghost after all. This was confirmed when she passed us on her bike as we cycled back to the village! The ghost in the lighthouse! It was a busy evening in the harbour with the ferry making a couple of trips, fishing boats departing and late coming sailing boats squeezing themselves in to the most unlikely spaces. The following morning the weather was terrible with heavy rain from about 0600. We decided to put up with it at about 1000 and were rewarded with a cracking close hauled sail and even the rain stopped about 1100. So after heading SW for about 20nm we arrived in the tiny harbour on the island of Femo. Femo is an even smaller island than Agerso so we decided to have a walk and visited one of the two villages and, as it is Sunday, the old church. This revealed that the first church had been established on the island around 1500, the current building is from 1903. Another Danish approach to be mentioned (not unique to Femo, occurred everywhere) is the sale of unwanted possessions at the garden gate. Smaller items are displayed on tables with prices (usually car boot level) and a money box left for people to pay. We noted that this couldn't happen in England as within five minutes the usual suspects would have pinched the box and contents. We returned to the harbour to find that a few more boats had arrived. 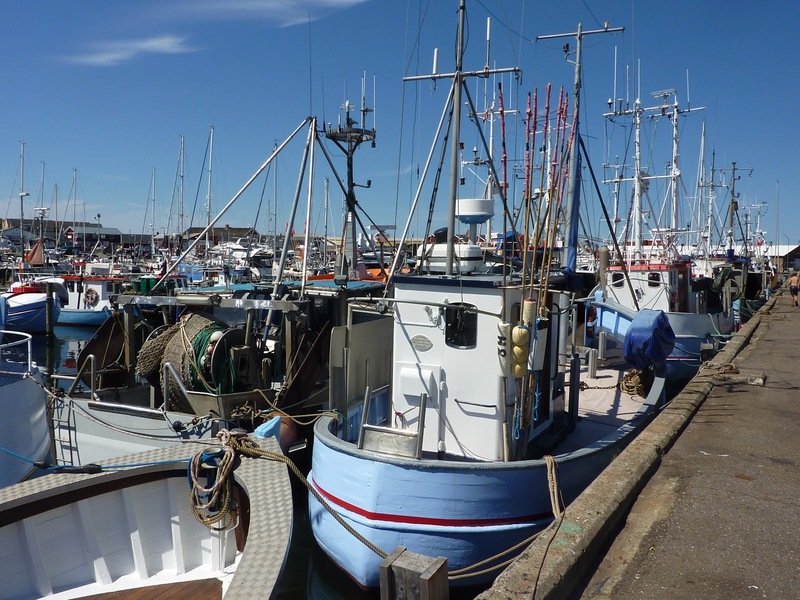 But by the end of the day, when the Harbour Master came to collect the dues, the harbour was fairly full with perhaps 15 boats in the outer harbour and 10 visitors in the inner harbour (plus about 15 locals). The ferry arrives three or four times a day and seemed to carry about 10 vehicles maximum plus just a few foot passengers. As we sat on our boat we admired the many swallows constantly swooping over the harbour collecting the many midges and small flies, quite a few disappearing to nests to feed their young. 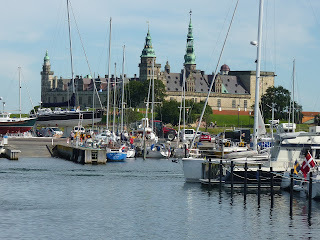 On Monday morning we set sail with our planned destination being Vordingborg just 22nm miles due E. Fortunately the wind was still coming from the W so we had an excellent down wind sail towards the road and rail bridge that connects the big islands of Sjaelland and Falster. After the bridge we had to cut across some very shallow water in the middle of the channel; and to our surprise (and delight) found that there was a newly created buoyed channel that took us 2nm diagonally across the sand and enabled us to pick up another buoyed channel into the marina at Vordingborg. So for the last 5nm (about an hour) after the bridge the average depth was around 1.5m and it got as low as 0.5m! Fortunately we did have some deeper pools too! We arrived at Vordingborg, which is a reasonable size marina at about 1400. Despite the early hour the harbour was very full, all the boxes were taken and boats were already rafted out in places. We found an alongside berth right in front of the Clubhouse and were relieved to squeeze in. Vordingborg is clearly a very popular location and when we walked the short distance through the ruined castle walls into town we discovered why it might be crowded. This was the first day of a six day music festival and the town was packed even at 1600 on a Monday afternoon. There were musicians playing in bars and cafes and in the castle grounds work on a big stage was being completed. In addition there were many street vendors in the town and we also noticed some serious looking men pulling a caravan and handing out leaflets from the Folk party. Talking to the Dane who was skippering a boat that rafted up to us later we discovered that these are the Danish version of UKIP with similar views and approach. Like all we have met on this trip he was disappointed, concerned and couldn't understand the Leave vote in the UK referendum! Vordingborg's historic claim to fame is that of being the residence and power base of Vlademar I (Vlademar the Great) famed for reuniting the Danish Kingdom in 1157 after a period of civil war. Also notable is the Church, Vor frue Kirke, dating from the mid-fifteenth century with elegant frescoes and a wonderfully carved baroque altarpiece created in 1642. Although the marina is more than half a mile from the castle grounds we could enjoy the live music until well into the night! So one night was enough and the next day we set off on a short journey W through the sound, gently runing before the wind whilst carefully following the many cardinals and buoys to stay in a channel in some shallow areas. After 12nm we passed under the bridge linking Sjaelland and Mon and turned immediately to port to the harbour at the village of Kalvehave. On our way in the small ferry across the sound (might take two cars) passed us. We had a pleasant afternoon walk along the coast footpath and then through unmetalled roads with small one storey houses on spacious heavily landscaped plots. It was also a sunny afternoon and evening so perhaps the weather is set to improve as we head N over the coming days? 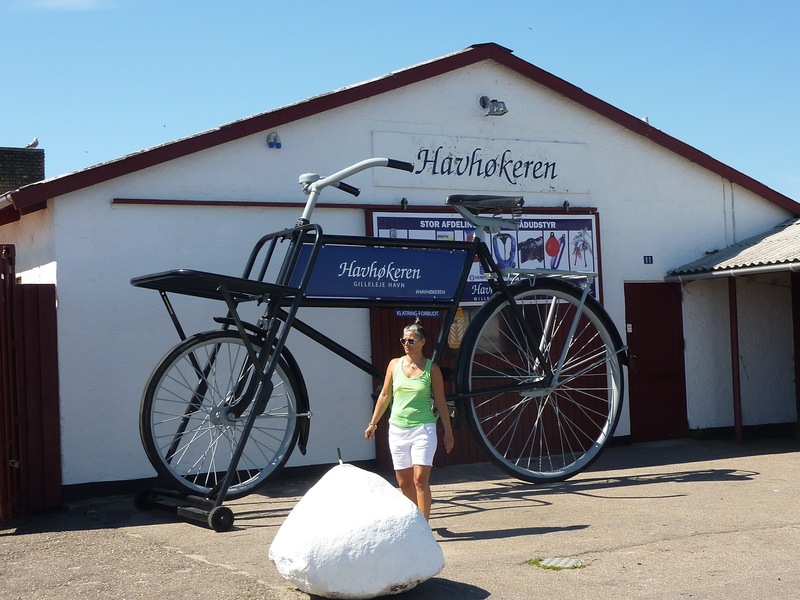 We returned to Fehmarn Island on Monday 27 June. Our journey from the UK started with concern as our first train (First Great Western) was running 10 minutes late thus risking our connection at Salisbury. As it happened we made it only to join a train packed with muddy Glastonbury campers heading home, most of them asleep! The journey involved taxi from home to Warminster; train to Salisbury then train to Woking; minicab to Heathrow T5; Flight to Hamburg; S Bahn train to Hamburg hbf (central station); ICE train to Puttgarden; local train to Berg; taxi to Bergtriefe Marina. Left home 0840, arrived 2000LT (1900 BST), so just over 10 hours. Tuesday was spent on shopping for stores and readying the boat together with a walk around the nearby beach. The weather forecast for Wednesday was for a fresh breeze from the SW but some likelihood of rain overnight and into the morning. We resolved to make a prompt 0800 start but at that time the sky was universally black or dark grey and rain was coming down in stair rods with consequent poor visibility, so we decided to postpone for a while. It took until 0930 for the rain to ease but we slipped the mooring to head into what was then a strong S wind. Initially we had to motor about 3nm south but we could then turn to starboard to pick up the buoys that mark the channel that takes you through shallow water and under the road and rail bridge that links Fehmarn island to the mainland. By then the wind had turned more W but we were motor sailing. Once we had passed the shallows off the SE side of Fehmarn Island and were turning on to a NW course we unrolled the genoa and turned off the engine to begin a pleasant few hours sailing at 5-6kn towards the Danish islands. By mid afternoon we had sunshine and could see the S coast of Langeland and we began heading in a more N direction standing off but in parallel to the coast. At this stage the wind picked up becoming a NW F6 with gusts to 30kn making the sea lively, so it was pleasing that about 7 hours and 35nm after slipping our mooring we were mooring in the harbour at Bagenkop, our first port of call in Denmark. Bagenkop harbour, Whileaway in the foreground. Bagenkop is a traditional fishing village with ship support facilities. As fishing has reduced in scale leisure activities, mainly camping and holiday homes, have increased. We were immediately impressed by the smartly uniformed Harbour Master (complete with peaked cap) who came round in the early evening to collect the dues! The following day, again one with grey clouds and a strong wind in the morning, we cycled round the village, inspecting the church with its model ships hanging from the ceiling and then buying some locally caught fish from the fishmonger. After that we headed into the open country towards the southern tip of the island. This part of Langeland has a unique landscape with many small round shaped hills created during the last ice age. There are some large tracts of open country and for many years wild Exmoor ponies have been allowed to roam as they do a great job of maintaining the natural landscape and are very hardy able to stand the cold and snowy winters. We were lucky enough to come across a big herd, including young foals, and they were confident enough not to be spooked as a few other visitors and ourselves came within about 4m of them. The outlook for Friday was not good as the wind was forecast to be at the top end of F5 and close to our heading. But we had less than 10nm to go so we set off around 0930 for Marstal on the nearby island of Aero. It was not a pleasant trip as not only was the wind constantly towards the top of F6, but also a big sea had been set up and it was right on our beam causing the boat to roll strongly from time to time. However in just under 2 hours we were following the narrow channel towards the harbour and then tieing up within another of those perishing boxes! Aero is in the South Funen Archipelago and is just served by ferries as there is no bridge. It is about 30km long and 9km at its widest point and has a population of over 6,000. 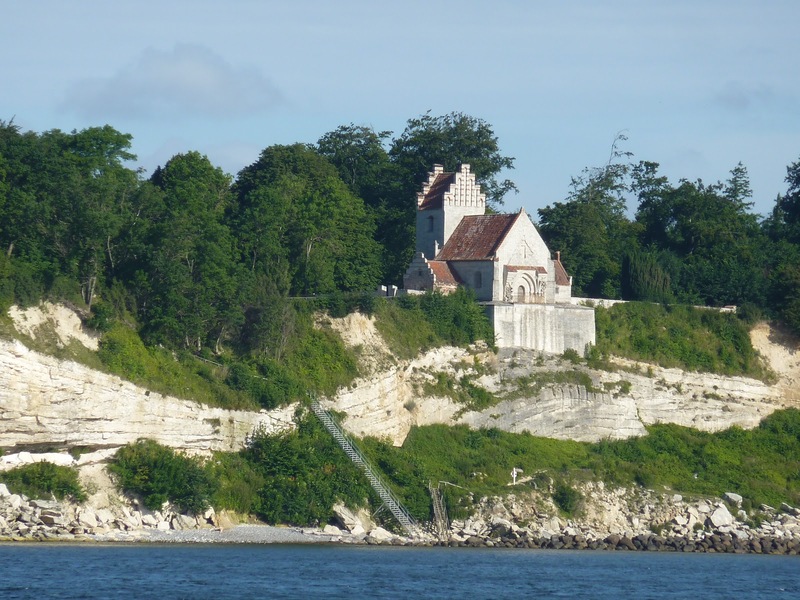 It is said to be one of the prettiest islands in Denmark. There are three towns and Marstal is the most southerly.Marstal is the largest town and has a long maritime history which is evident everywhere. It still has a small commercial dockyard and floating dry dock for repairs as well as a nautical school where navigators are taught. The town itself has narrow alleys and passageways and quite a collection of shops. That evening we ate out at a small simple restaurant next to the marina. It was busy and after a while we were asked (as others had been) whether we would share our four place table with another couple. This turned out to be Jurgen and Monika, a sailing couple from North Germany, who spoke excellent English so we had a very interesting discussion with them about the disastrous referendum result and why this problem had arisen! Not surprisingly I think that they are bewildered by the logic of the decision but also mystified by the assumption that the EU will want to create a generous trading arrangement for the UK! One excellent service on Aero is an hourly free bus service that links the three towns. So on Saturday morning we "sailed" the bus to the northern town of Soby. There some sort of local event was taking place, involving men jousting with lightweight poles whilst balancing on a couple of telegraph poles above the harbour. Needless to say there were plenty of splashes! The town is small but attractive. 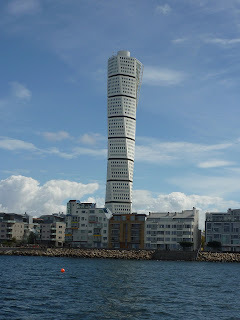 We then took the bus back, stopping off for a few hours at Aeroskobing which is half way up the northern coast. Aeroskobing is described as probably the most well preserved Danish town of the eighteenth century although it dates back to the middle ages. Aeroskobing has cobbled streets, beautiful flowers (plenty of hollyhocks) and many small well preserved houses with some interesting details and curiosities! It is recognised as a site of national significance but not with standing that it seems to be lively and interesting. Old house and newer three wheeler run about! Returning to Marstal we met Jurgen and Monika again, looked over their lovely seventy year old restored yacht and chewed over politics and sailing over a beer! Through Saturday/Sunday night it seemed to rain continuously but amazingly about 0900 it stopped and we prepared to slip our mooring. I checked the weather forecasts from two sources. They gave similar but not identical results with SW wind speeds of around 8-9 metres per second (the common unit in the Baltic). That equated to Beaufort Force 5, so an assumption that we might get gusts to F6. Our passage was going to be about 25nm W to Faaborg on the island of Fyn. For about the first hour and a half this involved following buoyed channels that kept us in water with a minimum depth of 2.5-3m (we need 1.4m absolute minimum). After that 90 minutes we then had about two and a half hours in deep water (up to around 30m) before approaching Fyn between the islands of Avernako and Lyo and then Knoldon and Bjorno. This again involved careful navigation as we skirted areas of shallow water and isolated rocks. Our departure started well enough with a pleasant F4 W breeze but as our journey progressed this increased to F5, then F6 (11-14 m/s) with gusts to F7 (15m/s, 33kn). We could see big storm clouds around us and the wind also became more W so we were motor sailing just off the wind at times. I did head further W than planned trying to seek some shelter from the NW part of the island of Aero and when the wind was over 30kn and still climbing I did discuss with Andrea seeking refuge in the harbour at Soby that we had visited the day before. But we decided to carry on and the wind began to abate and towards the end of the passage we did get shelter from the islands as we passed them. But this was the third consecutive passage where we have had winds of F4-5 forecast and F5-6-7 delivered so we will be even more cautious about the forecasts in the coming weeks! 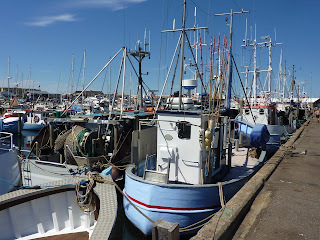 We found plenty of space in the town harbour at Faaborg and picked a box next to a Danish couple. As the afternoon wore on the sun came out and the wind dropped. The next day gradually became warm and sunny too so we had plenty of opportunity to explore an interesting small town. 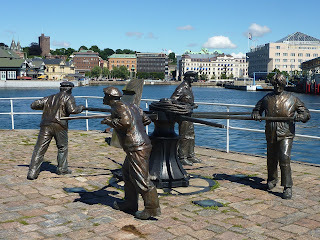 It retains its maritime heritage with a few fishing boats, ferries to smaller islands, ship repair and servicing facilities and visiting historic sailing ships carrying small numbers of cruising enthusiasts (about 20 people is typical). Just along from the harbour front is a new harbour bath; this has a new wooden pier and harbour staircase enabling people to easily take a swim in the Baltic sea. The town itself has many cobbled streets and attractive medieval and later merchants houses with an attractive central square and one town gate from the middle ages. We particularly enjoyed climbing the recently restored bell tower of the Holy Spirit Church, the only part remaining from the original 1450 building. In the evening we ate at the cafe on the harbour side which has its own fish smokery (we also ate at a similar establishment in Aeroskorbing - who says that you can have too much of a good thing?). The fish of your choice is served with a traditional Danish potato salad. We also had some prawns (apparently called shrimps in Danish) smoked with garlic and some without. One thing that we have noticed is that food and other costs in Denmark are noticeably more than at home and in Germany and the Netherlands. With the collapse of the £ caused by the Brexit vote costs may be 20-30% higher, probably a more reasonable 10-20% higher pre-Brexit vote. One factor is that Danes are paid noticeably higher wages, especially at the lower end of the scale and this rightly feeds through to costs. 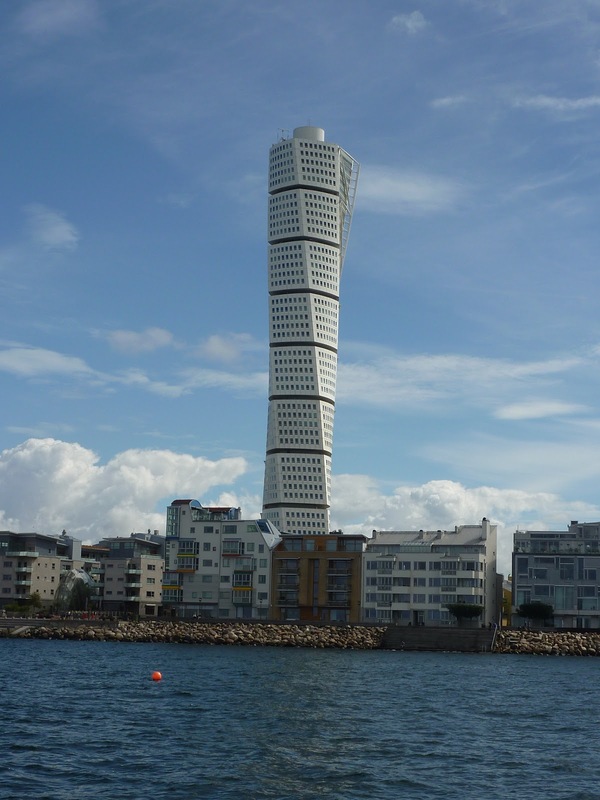 They also pay higher taxes but, as we have been reading in a book "A Year of Living Danishly" they get higher quality health and social support plus a much better standard of living in return. It is not surprising that polls show Danes at or near the top of polls for the happiest and most contented peoples in the world. Overnight and Monday morning bought the forecast lighter winds but a leaden sky. So at 0900 we slipped the mooring to head 16nm west to Svendborg, also on Fyn island. As we left the harbour a British yacht arrived - just the second that we had seen in our five days in this part of Denmark. An uneventful passage passing between islands and under a 33m high road bridge led us to the very busy commercial harbour in the centre of the town. It soon began to rain heavily and with a forecast of a gale overnight and into the next day we committed to staying two nights. Between the spells of heavy rain we walked around the large shopping centre, a mixture of old and new, more workmanlike than traditional. Old house - ill fitting windows and doors! 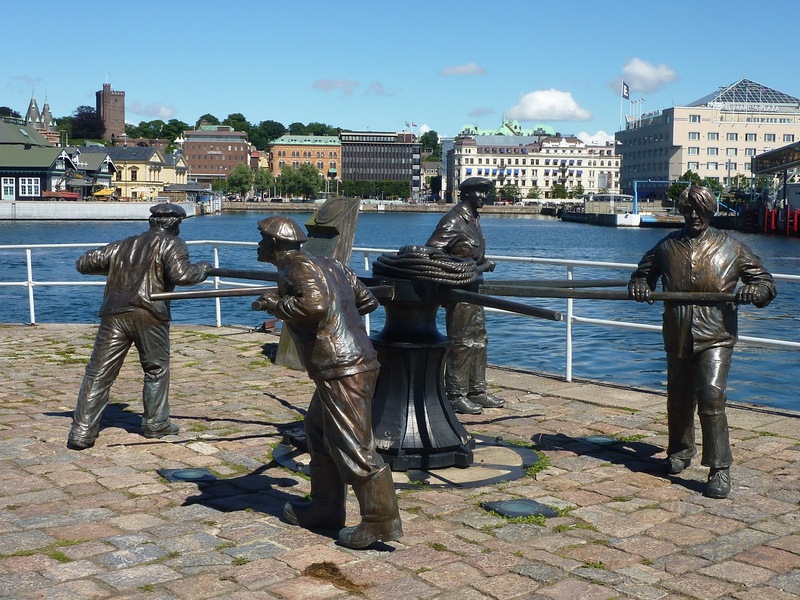 For tomorrow we have established that we can take the train to Odense, one of the largest cities in Denmark and the home of Hans Christian Andersen and plenty more besides.